Trade in your Oscar 2 Classic for $1,000 off a new Oscar 2! Please visit SunTechMed.com to view more information about the Oscar 2. SunTech will credit any ABPM* against the purchase of a new Oscar 2. 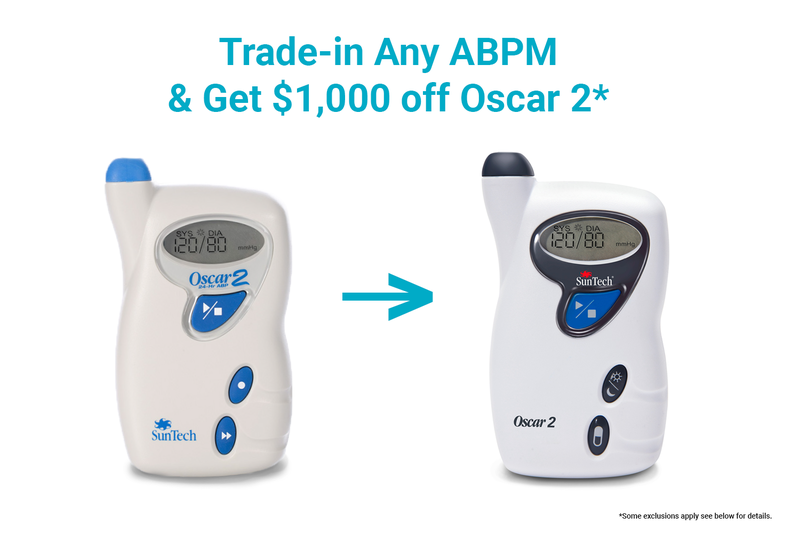 Must send trade-in ABPM to SunTech within 30 days of shipment of Oscar 2 to avoid full invoice price. Must be working ABPM monitor and at least 1 cuff. Age of the ABPM unit will be judged through manufacture date listed on the device. *Other brands may be accepted. Contact us for more information.